Prague: The collective of Autonomní sociální centrum Klinika decided to defend themselves against eviction by a non-violent happening on Thursday, January 10th. “We are calling SŽDC (the state railway company) to stop the absurd violent eviction and to return to discussions with the members of the Klinika collective and leaders of the capital city. There are 7000 empty houses in Prague and we want at least one of them to be non-commercial social and culture center,” says Klinika collective. Autonomous social center Klinika in Prague exists four years and it has been shown by its cultural, social and political activities that it is an important part of the city. “Managers of SŽDC (state railway company) are lying when they claim that they are forced to evict the building by court. It’s their own decision. Municipal district Pague 3 nor the whole Capital City don’t want Klinika to be evict, “says Markéta Juřicová, a member of the Klinika collective. SŽDC decided for forcefully eviction even though the Capital City of Prague officially show its interest to take over the building and to use it as a social and cultural center. Even Prague 3 wants to legalize the current state. “There are no reasons for leaving the house. In the case of eviction, the building will be empty for months and years and it will dilapidated. There is even a threat of demolition. Moreover, it is winter and there are people in the house who have no place to go, “says Jakub Ort from ASC Klinika. Construction proceedings are interrupted by the end of May 2019, so proclaimed reconstruction is unlikely to begin before the spring of 2020. Therefore after the eviction the building of Klinika will be the same ruin like the former squat Milada, as it has been ten years since the eviction there. 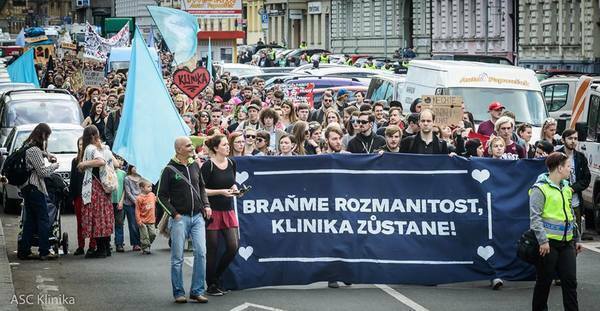 It does not make sense that the director of SŽDC Jiří Svoboda decided to evicted Klinika right now. “The project of reconstruction is purposeful, SŽDC itself does not know what it wants to do with the building, it has changed the purpose of the reconstruction several times – from the medical facility to the offices, then to the other facility. These projects prove to be economically disadvantageous, “says member of the Klinika collective. The collective of Autonomous social center Klinika decided to defend themselves against eviction by a non-violent happening on Thursday, 10th January, which would give public the opportunity to stand up for their vision of the city against the authorities. “We call on SŽDC to stop the absurd violent eviction and return to the meeting table with the members of the Klinika collective and leaders of the capital city. There are 7000 empty houses in Prague and we want at least one of them to be non-commercial social and culture center,” says Klinika collective. Callout to those who are not indifferent to the fate of this space. Despite the promising ongoing negotiations about the future of Klinika with SŽDC (the railway administration), the police has decided to evict. In the fall, when the new SŽDC management started to open negotiations, we welcomed this initiative and we came together in a specific way to preserve the social center and to resolve the future of the house to a mutual satisfaction. Nevertheless, the State decided to use violence to kick us out. Evicting Klinika does not make sense because of the ongoing negotiations, SŽDC doesn’t not even want to demolish the building. The eviction would just lead to another empty and decaying house. We don’t exclude the possibility of further negotiations, but we don’t want to put up with the fact that the state is trying to resolve the situation with violence and a demonstration of force. Indeed, the court’s decision does not force SŽDC to perform an eviction. This decision is a political one, apparently taken under police pressure. The eviction will take place on January 10th 2019. Therefore, early morning that day, we are calling for a solidarity breakfast, a protest gathering at Klinika. We’ll defend Klinika from an eviction as many times before. Show your solidarity to Klinika. For details, keep an eye on your network and around the corner.